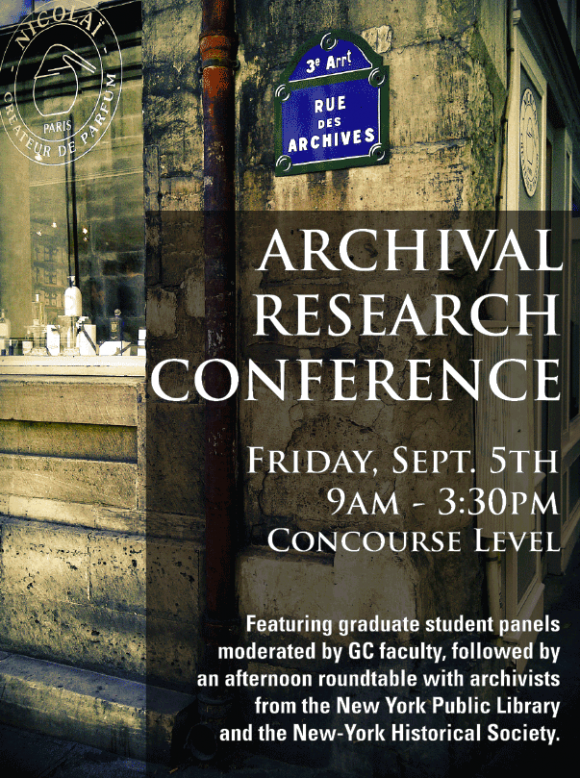 The Graduate Center’s first Archival Research Conference features student recipients of one of several different fellowships funded by the Provost’s office: the Lost & Found Stipends Program, the Provost’s Digital Innovation Grants, The Advanced Research Collaborative Award for Archival Research in African American and African Diaspora Studies, and The Advanced Research Collaborative Knickerbocker Award for Archival Research in American Studies. Panels moderated by Graduate Center faculty are followed by an afternoon roundtable featuring New York Public Library and New-York Historical Society archivists discussing the collections they curate. The conference is free and open to all, and it includes a complimentary lunch and reception. The schedule for the day is below. For detailed panel descriptions, see the full program. Yes, Questioner! The event is open to all. Bring a local archivist who might be interested. We will see you there. Can people from outside CUNY attend? As a CUNY student, can I bring a local archivist who might be interested?